A safe can be a big investment, and whilst it’s usually a worthwhile one, under some circumstances, a short term solution might be more beneficial. These include scenarios where cash and valuables are kept onsite, such as festivals and music concerts, in venues like art exhibitions and film sets or when valuables are being transported whilst relocating. At Thornhill, we are proud to be able to offer safe rental services, allowing our clients to hire out a safe from our range on a temporary basis from 1 week to as long as 6 months. Renting a safe from Thornhill Security gives you peace of mind, enjoying the benefits of our high-end safes at a fraction of the price. Our safes have been trusted for use at high-end events, most notably Glastonbury festival for over 20 years, film sets and even as props for movies. Opening up our full range of safes to our clients allows us to provide a safe to suit their needs, whether you need cash storage for your event, sensitive document storage whilst you move offices or cash and valuable storage for a film set. We will ensure that the safe you hire meets your requirements. 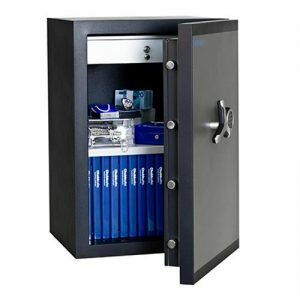 Consider the size and value of the items or cash being stored in the safe, we have a full range of safes designed to store cash, documents and larger safes for valuables. How many people need access to the safe? This will determine which type of locking system will be better suited to you. We offer safes with key locks or digital locks, if multiple people need access to the safe on site, a digital lock with a combination code will likely be better suited to you. How long do you need to hire a safe for? We offer safe rental from 1 week to 6 months, however, If the length of the job is uncertain for example, you are moving offices – you may benefit financially to buy the safe outright. Where does the safe need to be installed? If your safe needs to be installed in a hard to access location, such as the upper floor of a building the safe will need to be transported upstairs. We will go through your delivery location to ensure that our engineers can deliver and install your safe with minimal disruption. If you’re considering hiring a safe, give our friendly experienced team a call on 0117 9674994 to discuss the best options for you.